The distance from Baracoa to Holguin is only about 150 miles (250km) by the most direct route, but the only option if you want to travel by the Viazul bus service is to take the bus back to Santiago de Cuba and change there for Holguin. In theory this is possible in one day – if you take the 08:15 bus out of Baracoa which arrives in Santiago 13:45, you could then catch the 16:00 which gets into Holguin at 20:15. This seemed like a very long day along roads that we’d already seen so when we were planning our route through Cuba we decided that we would like to try to go along the notoriously bad road to Moa and there transfer back to Holguin where our flight landed. During our pre-trip research, it was difficult to find any clear information on how to do this and so here’s our trip report from April 2016 if anyone else is planning the same journey. 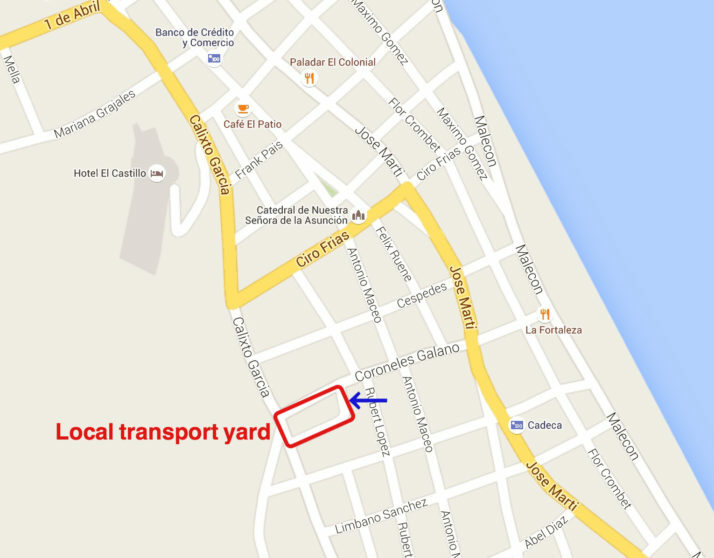 In Baracoa, you need to go to the local transport yard at the corner of Calixto Garcia and Coroneles Galano, just a few blocks from the central square. Early morning is best as there are no fixed schedules so you may have to wait for quite a while (we did). We arrived at 07:15. For Moa, wait at the far end closest to Rubert Lopez (see blue arrow in the map above) – place names are painted on the wall around the yard although we didn’t see them at first and asked around. While you’re waiting we recommend grabbing a fried egg sandwich for breakfast from the Terminal Cafeteria. I get the impression that usually transport is a bit more frequent because by the time the first truck pulled up at 08:30 a LOT of people were waiting. 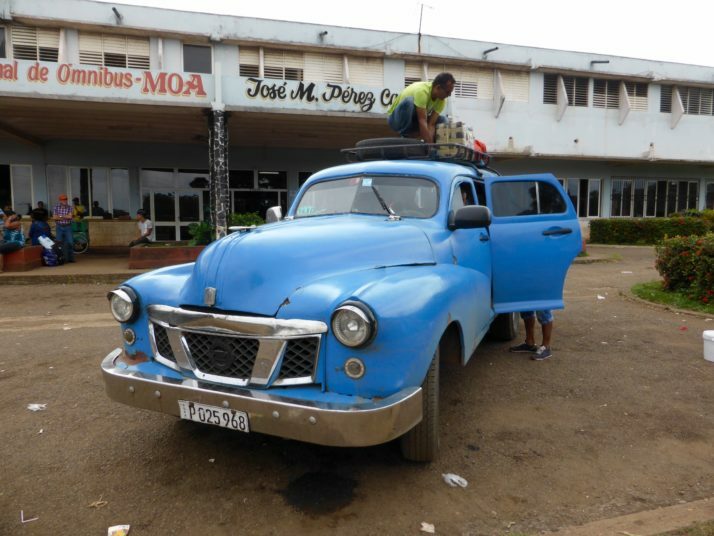 Also, I understand that it’s usually jeeps that do the Baracoa-Moa stretch but in our case it was a passenger truck with bench seats down either side of a covered back section. The guy who takes the money shepherded us in – it’s a bit of a scrum – we were the only tourists and he charged us more so I think we got some kind of priority. Locals were charged 60-70CUP (2.5CUC), we were charged 4CUC each, I tried to argue about this but there was no negotiating he just repeated the price. Our big rucksacks were stowed under the seats and our small rucksacks on our laps. The truck was tightly packed. The road from Baracoa to Moa is in a pretty poor state of repair with lots of potholes and it’s quite dusty as the back of the truck is open. We stopped after about 1.5 hours at a roadside cafeteria where it was possible to buy snacks (including cucuruchos at local prices = CUP5 each). The driver also changed the wheel as we had a puncture – lots of guys pitched in and we were on our way within 20 minutes. As we approached Moa we noticed a lot more heavy industrial activity compared to the more rural sights that we passed on the first part of the journey. The road passes the huge nickel plant and the wasteland stretching out around it. 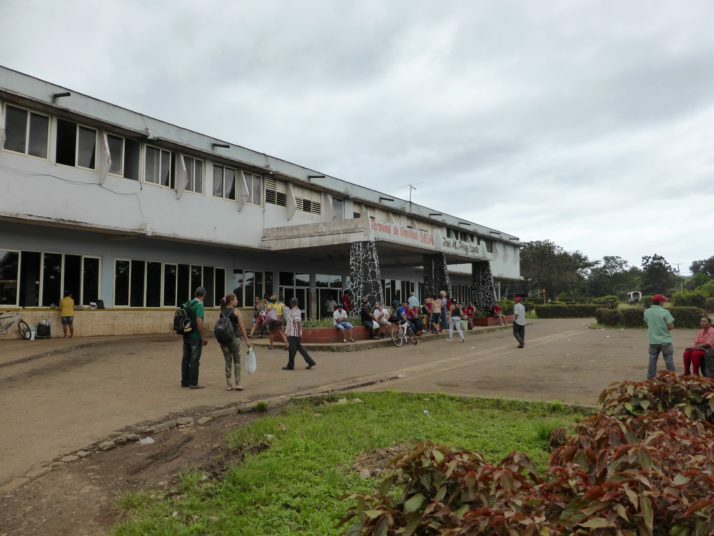 We eventually arrived at the bus station in Moa at 11:15 (a journey time of 2.75 hours) – this is the last stop so just get off when the truck empties. A local couple who came from Baracoa were also going on to Holguin and they adopted us – I don’t know their names but for the purposes of the story we’ll call them Pedro and Maria. We waited inside the bus station with Maria while Pedro went looking for colectivos (private taxis that leave when they’re full) out in front (after first checking the back to see that there were no trucks). The bus station has snacks available from various vendors and toilets (no running water) – follow the corridor behind the seating area to the right when you enter. I noticed on the timetable that the Omnibus Nacionales bus was due to leave at 1pm (37CUP) but Pedro asked at the ticket desk and it was no good for us as you must have a Cuban ID card to travel on that service. 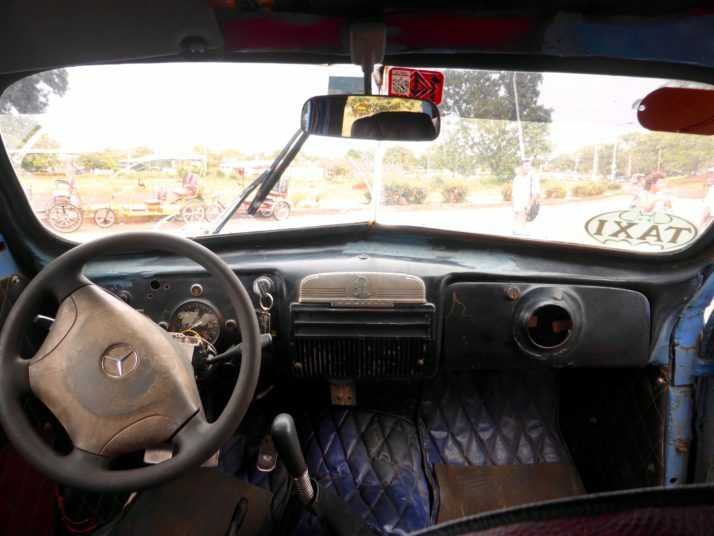 After almost an hour, he found a car that was going to Holguin – if you’re on your own I would recommend just hanging around outside and asking each vehicle that pulls up. The only problem was that the price for Cubans was 100CUP (4CUC) each but the driver said that for us (foreigners) it would be 10CUC each! I tried negotiating, including walking away back to the waiting room where the driver eventually followed us but he absolutely would not budge on the price. If we’d been alone we might have hung around to see if we could find a cheaper alternative but Pedro and Maria seemed to be reluctant to leave without us so we agreed. He did move the other passengers into the back so that we got the whole bench seat behind the driver to ourselves which meant we had lots of space and access to the windows to take photos. We left Moa at 12:15. 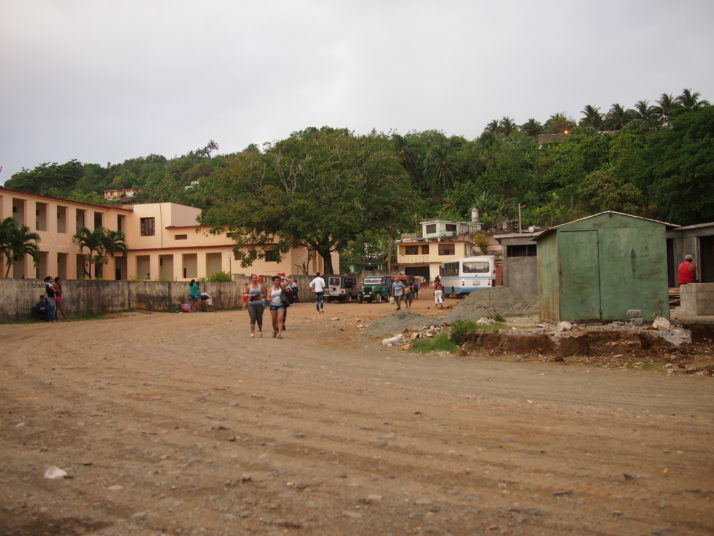 The road between Moa and Holguin is in a much better state of repair and we arrived in Holguin at 15:00 (a journey time of 2.75 hours) at the Intermunicipal Bus station on Avenida de los Libertadores, near the baseball stadium. There are lots of local taxis and bici-taxis hanging around to take you on to your destination, or it’s roughly a 1.5km walk from here to Parque Calixto Garcia in the centre of town. Another option to get from Baracoa to Holguin would be to arrange a tourist colectivo through your casa particular – we were quoted 30CUC per person based on a car with 4 passengers and our casa owner said he could ring around to find others who wanted to share the journey – obviously this would be much faster as there would be no hanging around at bus stations and it would probably also take you directly to your destination in Holguin. 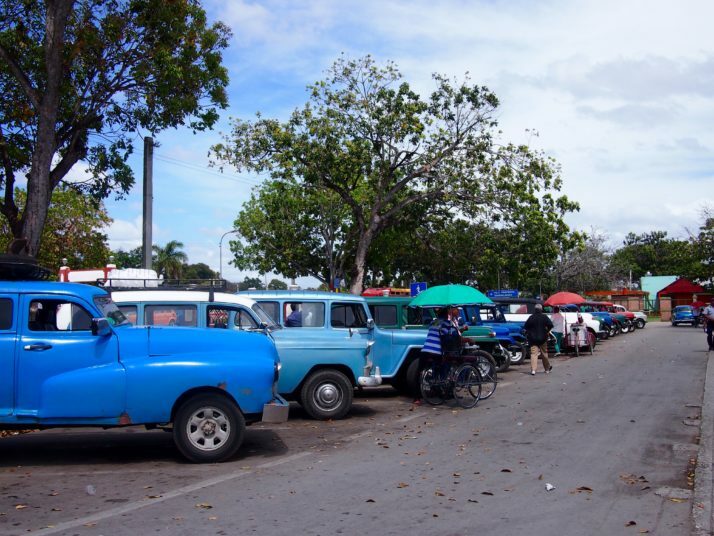 This entry was posted in How To and tagged Baracoa, Cuba, Holguin, How-To on June 5, 2016 by Julie. Many thanks for your detailed description of your journey! I just recently took the same route (taxi colectivo to Holguin for 20 cuc) but the main bridge across the Toa river was damaged in late 2016 (hurricane Matthew) and the temporary bridge was flooded due to strong rainfalls (quite typical for Baracoa). So we had to take 2 small rowing boats to cross the Toa river and then a horse cartridge through a muddy path to get back to the main road. It worked but was an adventure itself, probably not for everybody. The main bridge is being repaired at a he moment and according to the Cuban newspaper it’s finished 75%, but actually it’s more like 25% – and there was hardly anyone working ? Ps. 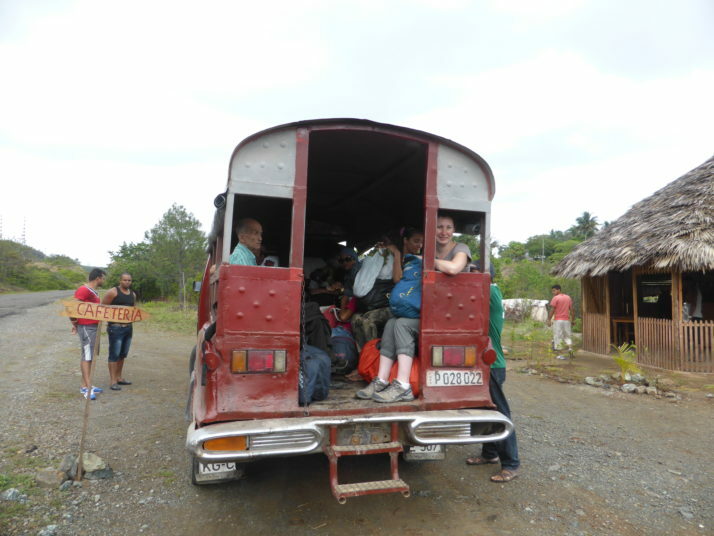 : From Holguin we then took the Camion (truck colectivo) from the Viazul station to Santa Clara for 10 cuc (almost 10 hours ride)! Thanks for your update – that sounds even more adventurous than the journey we did! What is 32 + 14 ?